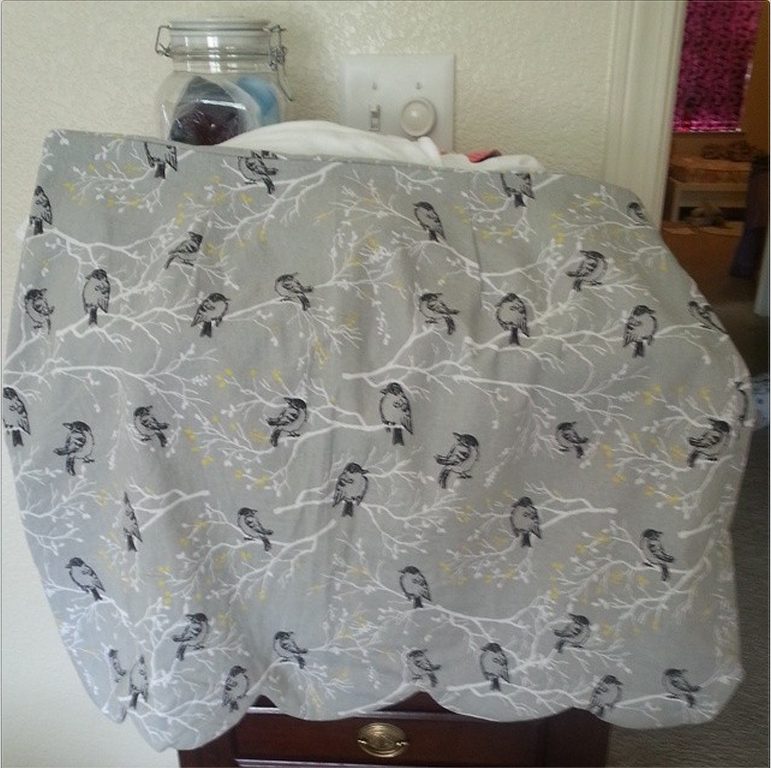 I finally finished the Meringue Skirt! The muslin took way longer than the actual skirt took. Partially, I think, because I already knew what I was doing the second time, and I wasn't really procrastinating as much on it as I was with the muslin. I'm still trying to figure out what exactly I was afraid of with the muslin. I don't have a full length mirror to take selfies in, and I feel really narcissistic asking my husband to take pictures of me. I should have taken in the waist a couple inches as well, but since I'm really new to this, I didn't feel confident in making that kind of an alteration. So instead of it sitting on my waist like it should, it comes down around my hips, which suits me just fine because that's where I wear my pants. Being a petite, high waisted things on me make me look shorter in the torso. I feel like Urkel. This means that those two inches I took out in the length pretty much mean nothing. In the models, the skirt falls a couple inches above the knee. On me, the bottom of the scallops hit just below my knee. But at least it's not that awkward few-inches-below-the-knee length that looks like it's supposed to be mid-shin but it's not...like it would have been had I not taken out the length. To me, this skirt looks way bigger than what it is, but honestly, I know I have some body issues. I weigh more than I would like, and my shapes are not where I want them to be, but in my head, my body image is slimmer than what I really am. The next pattern in the book is the Pastille dress, but if I'm really this big, and I google the dress and see others of my body type that have made it, I'm not happy with the results. I bought a really nice fabric, and I don't want to "waste" it on making something that I'm not going to love, all because I'm bigger than I would like to be. For the record, this is not me being unhappy with the social standard of what I should look like vs what I really do. This is me being unhappy with the way I look because I know how I have looked in the past...and I want that back. I was a healthy size 4 (off the rack) at one point. I still jiggled in places, so fear not, I was not anorexic. Bacon cheese fries are far too delicious for that. Now, I'm a size 10. I can get into a size 8 pair of petite skinny jeans (I tried this past weekend) and they fit, but they don't make me feel comfortable with myself, and I know that if I were to have sat down in them, I'd have that doughnut tummy going on. So for now, I'm going to stick to sewing skirts and keep working on my body until it's more where I want it to be. Shopping is great for pulling out your imperfections, especially in ready to wear. Every time I go shopping and am really honest with how clothing falls on me, I get really depressed. This time though, I knew what it was going to be like going into the "experience" and I feel that I'm coming at the issue from a much more mentally healthy standpoint. I'm almost 100% sure that I have sewing to thank for that. Sewing sizes run much larger than ready to wear. I cut the skirt pattern from a size 14 based on my largest measurement, which is my hips (thanks to two children). So my whole thing about sewing the entire Colette Patterns book will have to wait. I'm incredibly unfit and lose my breath easily. So while I build up to that, and slim down in the process, skirts it is! ... and loose dresses because Myrtle looks pretty amazing, even on the bigger model! Shut up, Mom. You know why.